Fares on BART vary depending on station and distance traveled. Passengers may either purchase a magnetic farecard (ticket) or Clipper card from a ticket machine. Insert ticket or tag card at a fare gate when starting and ending each trip. The fares are deducted from the ticket or card after each ride. Every passenger will need his or her own ticket or card. BART does not offer daily, weekly, monthly unlimited use passes. Fare discounts on BART are only provided when the farecards are sold. The same fares are deducted at the fare gates regardless of ticket type. 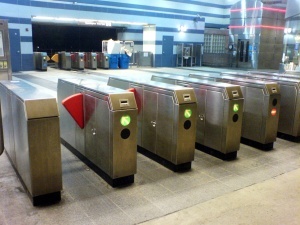 If you enter the fare gates and your ticket or Clipper card does not have sufficient funds for your trip, you will have to use add fare machine to increase your ticket's value so that you can exit the system. Clipper is a regional fare card can be used on BART instead of BART's own magnetic tickets. Clipper cards can be obtained from selected BART ticket machines and the cards can be used at all faregates. All BART ticket machines can also add values to existing Clipper cards. By using Clipper, you can avoid the $0.50 surcharge per trip. There's however a $3 fee to obtain an adult Clipper card from fare machines. Clipper for youth and senior riders is free but they're only available through transit offices, Clipper customer service center, by mail or internet. Clipper card can now be used for parking payment/validation under the EZ Rider program. BART to Muni transfer Two part transfer for discounted rides (or free rides from Daly City) on Muni. This discount is only available for riders using Clipper cards. Muni Fast Passes are accepted for unlimited rides between all stations within San Francisco. Riders on Capitol Corridor can buy $10 BART tickets for $8 on the Cafe Car. 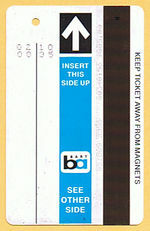 This is for BART magnetic tickets only. Clipper card fares are $0.50 less. The following table applies to riders using Senior, RTC Discount Card (Disabled), and Youth (age eligible) Clipper cards. Red and Green magnetic BART tickets continue to sell at a discount price with regular fares deducted. There are some quirks in the fare structure due to subsidies that apply to certain stations. 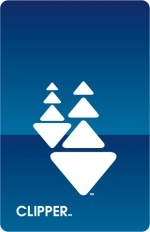 In some cases, BART fares violate the "triangle inequality" (a mathematical term meaning that a trip should not cost more than the sum of its parts). Although in most cases exiting and reentering the station in the middle of a trip cost more, there are several cases, involving the station Bay Fair or Orinda, where it is possible to exit and enter the station in the middle and have the total cost less than if you had simply stayed inside the system. This page was last edited on 8 October 2018, at 12:49.